Don't miss out on this special report. As inbound marketers, we understand the importance of social media as a channel for interacting with – and sharing content with – prospective and existing customers. What we often struggle with, however, is knowing if we are doing a decent job. Of course, the real measure of social media's effectiveness is ROI: if the social platforms you're on are consistently generating leads and customers, you can be sure you're doing something right. 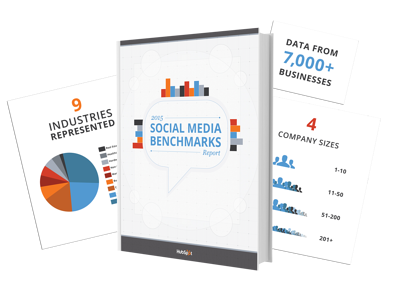 Using social data from 7,000+ businesses*, we've compiled a benchmarks report that will allow you to see how your business's social efforts stack up against the competitions'. Does my company have an above-average number of social followers for its size? How many social media posts does the typical company in my industry publish per week? *Industries included in the report: Real Estate, Healthcare, Hardware, Nonprofit/Education, Manufacturing, Business/Financial Services, Consumer Goods/Retail/Ecommerce, Marketing Services, Software/Tech. I want to see the report now!